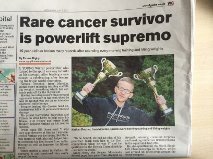 Nathaniel Fletcher featured in the Wirral Globe paper this week and also interviewed live on BBC Radio Merseyside. Some great recognition for all his hard work. Please accept my sincere apologies for not responding to your comment but I have only just seen this now. I clearly need to come onto my website more often and actually look around. If its something you still would like please get in touch and I will sort out some sort of freebie for you.